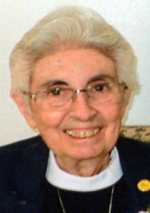 Sister Maria Isabel Carpio- More, I.H.M. Sister Marie Isabel Carpio-More, I.H.M., died Jan. 15 in Camilla Hall, Immaculata, just shy of her 76th birthday in the 54th year of her religious life. Born in Lima, Peru, Sister Isabel entered the Congregation of the Sisters, Servants of the Immaculate Heart of Mary in 1964 in the congregation’s House of Formation in Las Condes, Santiago, Chile. She professed her first vows on Feb. 11, 1967 in Chile. Sister Isabel served in many different capacities in her native South America. She served as grade school teacher; teacher of religion in high school; coordinator of pastoral activities; assistant to Religion Department and pastoral chairperson. In April 2016, Sister Isabel became ill and came to the United States to receive the needed care in the nursing convent home, Camilla Hall. She then began her final service dedicated to the Apostolate of Prayer. Sister Isabel is survived by her sisters Rosa Maria, Augusta, Raquel and Ana Maria; her brothers Guillermo, Luis and Miguel; and many loving nieces, nephews, grandnieces and grandnephews. Sister Isabel’s three sisters visited her in Camilla Hall in September but it was not possible for any of the family to travel from South America for Sister Isabel’s funeral Mass in the United States. Father William Dean celebrated the funeral Mass at Camilla Hall on Saturday, Jan. 19. Many of the I.H.M. sisters who were missioned in South America over the years attended this beautiful Mass and participated in the entrance and recessional procession. It was a most loving tribute to Sister Isabel.